Taste test: I really like what Kettle has have done with the Crunch Cut line of potato chips. 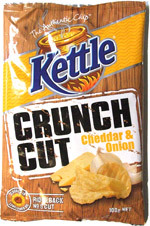 The ridge cut was good and yet retained all the best elements of the original cut Kettle Chips. The cheddar and onion flavoring was perfect. They were not too heavy handed with the onion or the cheese, plus there were some subtle herbs. I was very impressed.